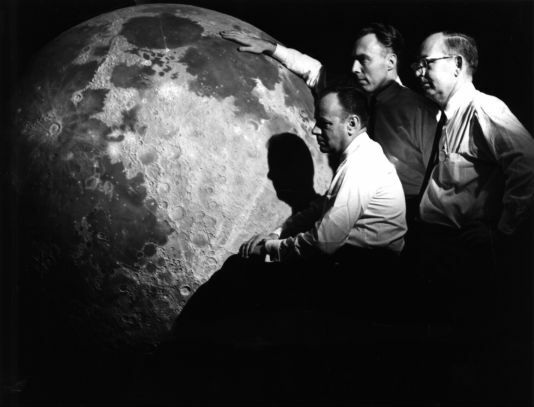 A team and a goal: officials of North American Aviation, Inc., study a replica of the moon shortly after the announcement that NASA had selected NAA as prime contractor for the Apollo command and service modules. 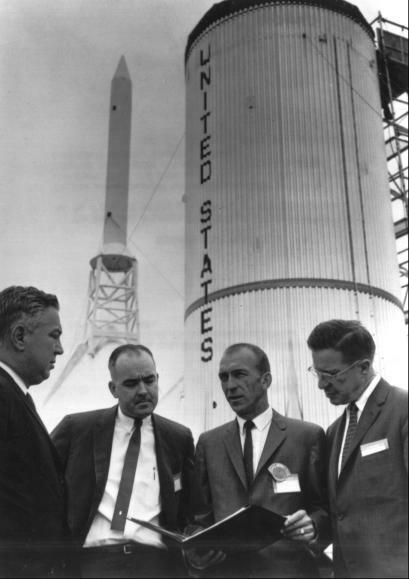 From left to right are Harrison A. Storms, president of North American's Space and Information Systems Division; John W. Paup, program manager for Apollo; and Charles H. Feltz, Apollo program engineer. 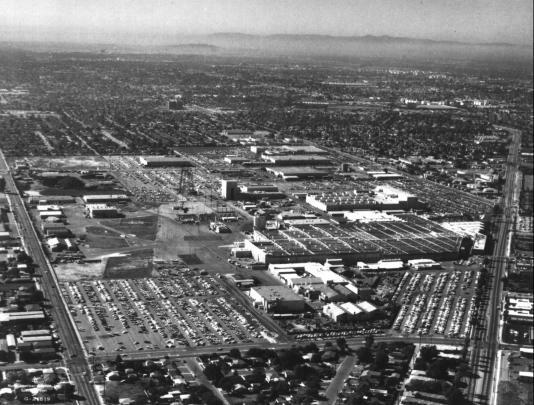 The North American Aviation plant at Downey, California, developed and produced the Apollo command module. Storms' team operated from a two-story building in Downey, California. Design engineers and draftsmen occupied the major portion of the structure, their desks crowded together in cavernous halls. An adjacent building housed the manufacturing activities for the space division. Ninety percent of the property belonged to the federal government, but long-term leases had made North American, as tenant, virtually the proprietor. Now, with the Apollo contract, plans were made to recruit personnel, to buy adjoining property, and to construct more buildings and facilities. In the meantime, some of the personnel worked out of house-trailer offices in the parking lots. 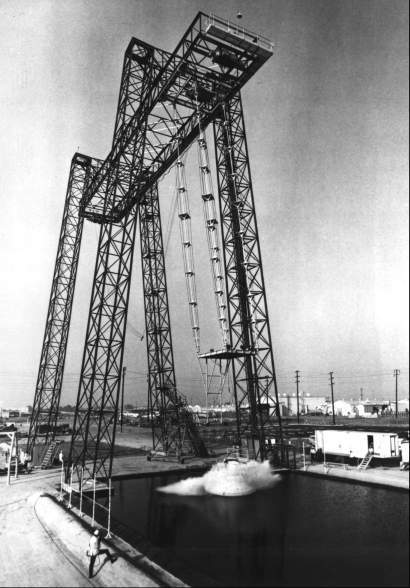 The impact facility at North American was used to drop-test the CM on water, sand, gravel, and boulders to check structural integrity and impact loads. Shortly after the NASA-North American contract was signed, subcontractors for four of the spacecraft systems were picked: (1) Collins Radio Company for telecommunications; (2) The Garrett Corporation's AiResearch Manufacturing Company, environmental control; (3) Minneapolis-Honeywell Regulator Company, stabilization and attitude control; and (4) Northrop Corporation's Radioplane (later Ventura Division, parachutes and earth landing. Interior of a partial full-scale mockup of the Apollo command module. In flight, the center couch would be removed as shown), giving better access to the instrument panel and lower equipment bay. At left, left to right, astronauts Scott Carpenter, John Glenn, and Walter Schirra in 1963 inspect a full-scale mock up of the Apollo CM, designed for three men. General Dynamics' Little Joe II program manager Jack Hurt (holding book) discusses development and production plans with NASA officials (left to right) Walter Williams, Robert Piland, and James Elms at the San Diego plant in May 1963. Selection of Little Joe II completed the Apollo family of launch vehicles. 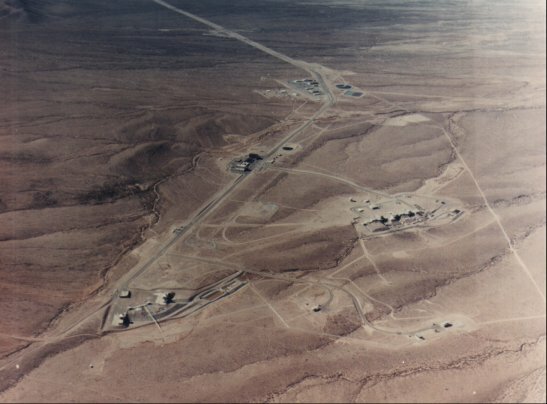 A desert area at White Sands Test Facility, New Mexico, was used for testing the spacecraft propulsion system module. A pad abort test at White Sands, left, helped determine that the launch escape system could propel the Apollo command module away from danger if a Saturn launch vehicle explosion should threaten. A model of the CM, below, launched by a Little Joe II in 1965, is recovered after impact on the New Mexico desert. 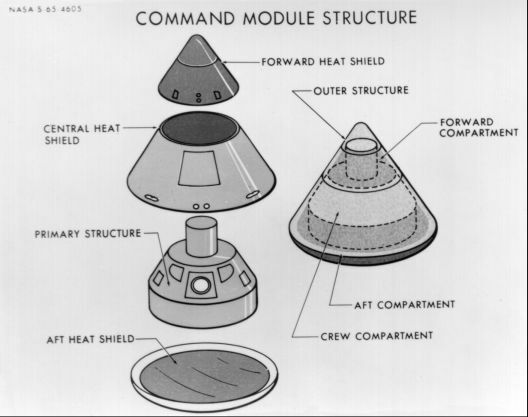 The drawing outlines major parts of the command module structure. The cabin section (or primary structure) of the CM is assembled at North American in 1965. Even though the Manned Spacecraft Center had gained its independence and had moved away, the ties between NASA-Langley and NASA-Houston remained strong, providing another source to draw on for help. Shortly after the move to Houston, Axel T. Mattson came to Texas as full-time liaison officer, coordinating the use of Langley's five-meter transonic wind tunnel in testing and studying the aerodynamic effects of reaction control jets and escape tower exhaust plumes on the command and service modules. Technicians prepare aft heatshields to attach to model CMs. 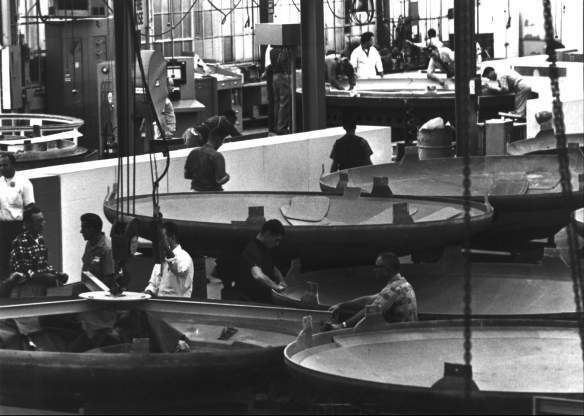 These shields were made of fiberglas for test vehicles that did not require heat protection; the finished versions were of the same materials as the central heatshield. Langley's wind-tunnel experts also conducted diagnostic tests of heat transfer, heating loads and rates, and aerodynamic and hydrodynamic stability on the command module heatshield. The heatshield contractor - the Avco Corporation's Everett, Massachusetts, division - had proposed an ablative tile shield, a layered and bonded single-piece construction similar to that used on Mercury. Then McDonnell had advanced heat protection technology by developing ablator-filled honeycomb material for Gemini. When North American and NASA engineers approved this thermal protection Avco refined the new system to withstand the higher heating rates of lunar reentry. 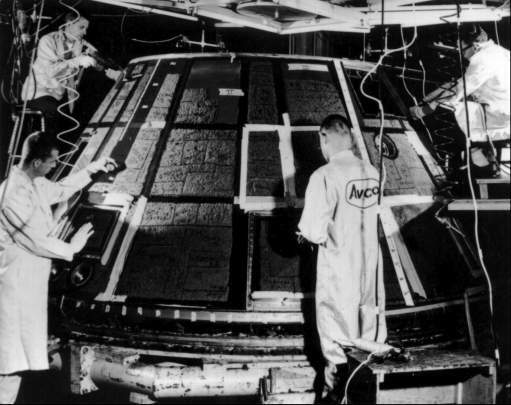 McDonnell's Gemini heatshield was made of a Fiberglas honeycomb material; the ablator, developed by Dow-Corning, was poured into it and allowed to harden. 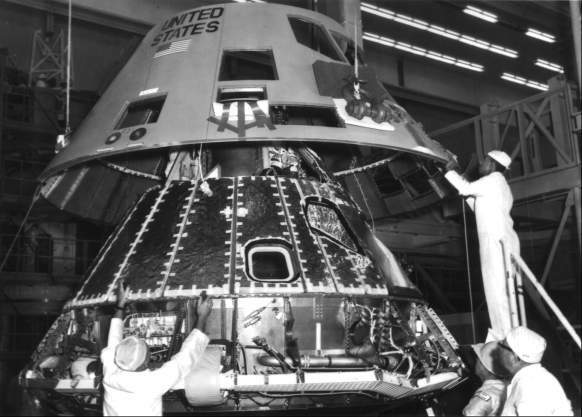 The Apollo ablative heatshield, however, was bonded to an inner brazed stainless steel honeycomb shield, and the 400,000 honeycomb cells in its plastic outer shield were filled by hand using a caulking gun,20 with an ablator developed by Avco. 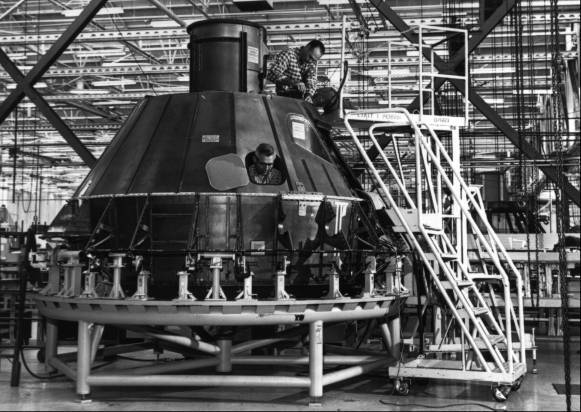 Technicians work on the central heatshield, the two men on the sides applying heat-protection ablative material with caulking guns. A completed central heatshield is lowered into place over the primary structure in May 1966.
landings for the lunar program. At NASA Headquarters, George Low told Brainerd Holmes that North American's concentration on parachutes for Apollo would mean the end of the paraglider for that program. Holmes wanted to know if it could be put in later, provided the technical difficulties were solved. Low said this could be done only if the paraglider were ready within a year.23 When NASA and the Navy recovered John Glenn and Scott Carpenter and their Mercury spacecraft from the water with comparative ease, chances for a dry landing in Apollo grew slim. NASA's top officials had been concerned about MIT's ability to build a guidance and navigation system that would take a crew to the moon and back to the earth. As the system began to take shape, another worry cropped up. Would the Instrumentation Laboratory be able to manage the industrial contractors once the design evolved into development? To be certain that the subcontractors understood the arrangement, Seamans visited the Wakefield Laboratory of AC Spark Plug in July, where he was assured that AC and MIT could work together just as they had on the Titan II inertial guidance system. But the managerial task in the complex and interlocking systems of the command module, as well as those of the other vehicles in the Apollo stack, had to be spelled out in precise and formal guidelines to ensure orderly progress. A system of "Interface Control Documents" became standard. 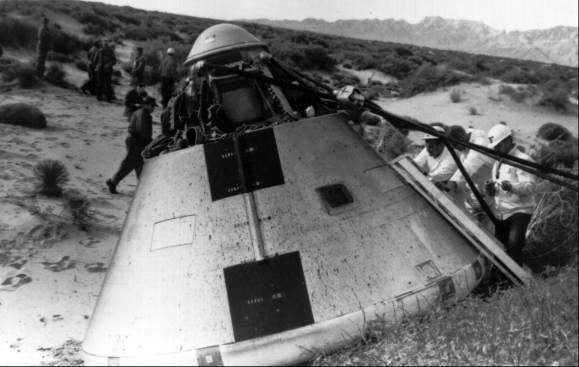 All in all, during 1962 good progress had been made in getting command module development under way. 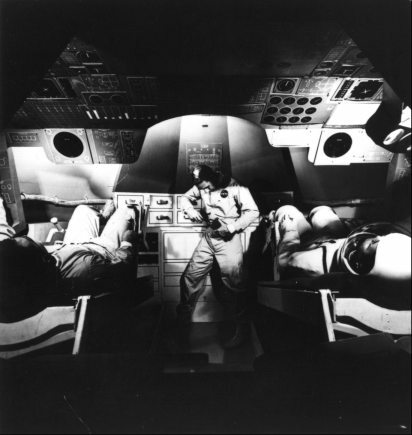 Contractors were working together, and cooperation among the NASA field centers had improved. One of the underlying factors in this advancement had been the establishment of a formal Apollo spacecraft management office at the Manned Spacecraft Center. In January 1962, when Charles Frick became manager of the new Apollo Spacecraft Project Office, he assumed responsibility "for the technical direction of North American Aviation and other industrial contractors assigned work on the Apollo Spacecraft Project." Frick arrived at Langley Field, Virginia, just in time to meet the 45 persons that his deputy, Robert Piland, had gathered into the new project office before they moved to Houston on 1 February. The new organization settled into the Rich Building, one of the center's 13 rented sites scattered around the Gulf Freeway.30 But, even before Frick's arrival and the establishment of the formal spacecraft office, the Apollo workers in Gilruth's center had taken on an expanded responsibility. * Chilton's board members were Caldwell C. Johnson, Jr., Charles F. Bingman, Arthur E. Garrison, and Carl D. Sword of MSC; Richard C. Henry and Earl E. McGinty of NASA Headquarters; Merrill H. Mead of Ames; and two nonvoting participants, Ralph Ragan of MIT and James T. Koppenhaver of NASA Headquarters. 2. Harrison A. Storms, Jr., interviews, Downey, Calif., 6 June 1966, and El Segundo, Calif., 16 July 1970; Philip Geddes, "How NAA Won Apollo . . . 'management,'" Aerospace Management, 1962, no. 4, pp. 12-16; biographical sketch of Storms in Shirley Thomas, Men of Space: Profiles of Leaders in Space Research, Development. and Exploration 4 (Philadelphia: Chilton Co., 1962); 206-32. See also Art Seidenbaum, "Quarterback for the Moon Race," Saturday Evening Post, 5 May 1962, pp. 85-90. 3. John W. Paup, interview, Downey, 7 June 1966; Beirne Lay, Jr., Earthbound Astronauts: The Builders of Apollo-Saturn (Englewood Cliffs, N.J.: Prentice Hall, 1971), pp. 77-81. 4. North American, "Norman J. Ryker, Jr., Vice President, Research, Engineering and Test," news release, 26 March 1970; Ryker, interviews, Downey, 9 June 1966 and 20 July 1970. 5. North American, "Charles H. Feltz, Program Vice President, Space Shuttle Orbiter Program," news release, 8 July 1970. 6. J. Leland Atwood, interview, El Segundo, 16 July 1970; Samuel K. Hoffman, interview, Canoga Park, Calif., 17 July 1970. 7. Oakley, "Historical Summary," pp. 6, 7, 43-44. 8. North American, "Apollo Facts," [ca. August 1963]; North American, "Impact Test Facility," news release NS-16, 3 April 1963; Ryker, "Technical Status of the Apollo Command and Service Modules," North American SID 64-698, 3 April 1964, p. 19. 9. D. W. Chidley, "1962 Annual Report on Department 663, Apollo Mockup, Boilerplate Structural Assembly Department," North American, n.d.
10. Jack R. Hahn, interview, Canoga Park, 15 July 1970. 11. "Four Additional Companies Named to Work on Apollo," MSC Space News Roundup, 27 Dec. 1961; Earl Blount TWX to Lt. Col. John A. Powers, 12 Feb. 1962; Oakley, "Historical Summary," pp. 5-6; Sanford Falbaum, interview, Long Beach, Calif., 15 July 1970. 12. Paup to Charles W. Frick, 1 June 1962; R. L. Benner, interview, Downey, 7 June 1966. 13. Alan B. Kehlet et al., "A Preliminary Study of a Fin-stabilized Solid-Fuel Rocket Booster for Use with the Apollo Spacecraft," NASA Project Apollo working paper No. 1020, 7 June 1961; William W. Petynia, interview, Houston, 9 Dec. 1970; General Dynamics, Convair Div., "Little Joe II Test Launch Vehicle, NASA Apollo: Final Report," GDC-66-042, May 1966; NASA, "NASA Project Apollo Statement of Work, Test Launch Vehicle Little Joe II)," 31 March 1962. 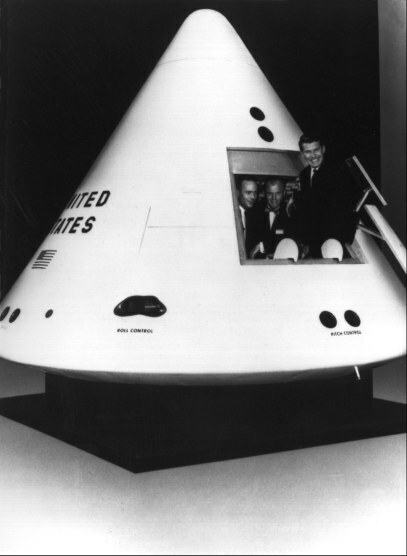 For a discussion of the origins of the Little Joe vehicle for Mercury, see Loyd S. Swenson, Jr., James M. Grimwood, and Charles C. Alexander, This New Ocean: A History of Project Mercury, NASA SP-4201 (Washington, 1966), pp. 121-26. 14. 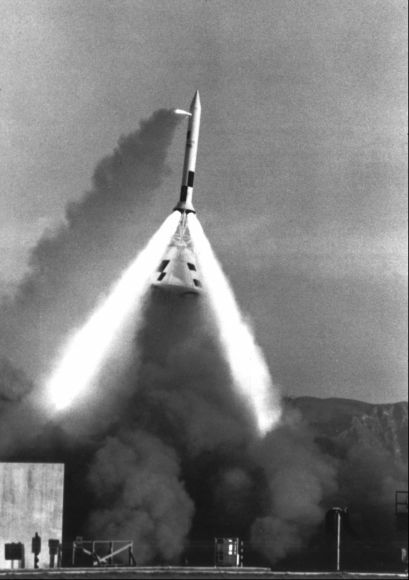 Petynia to Mgr., ASPO, MSC, "Trip report to White Sands Missile Range on May 17 and 18, 1962, to discuss Little Joe II and pad abort flight configurations and tests," 2l May 1962; Holmes to Assoc. Admin., NASA, "Apollo Spacecraft Propulsion Development Facility Site," 13 June 1962, with enc., "Site Recommendation for Apollo Spacecraft Propulsion Development Facility," p. 5; Maj. Gen. John G. Shinkle to Robert R. Gilruth, 4 June 1962; James E. Webb to Robert S. McNamara, 10 Aug. 1962; Robert P. Young to Webb, "Selection for site to test Apollo service module," 4 June 1962; idem, note, 7 June 1962; "Agreement for Construction and Operation of an Apollo Spacecraft Propulsion Development Facility at the White Sands Missile Range," approved by Hugh L. Dryden for NASA and Paul R. Ignatius for the Army, 19 Dec. 1962. 15. J. Thomas Markley, "Apollo at White Sands," MSC Fact Sheet 97, 11 Sept. 1962. 16. Calvin H. Perrine to Apollo Spacecraft Project Officer, "Minutes of Meeting at Ames Research Center on Aerodynamics and Meteorite Impact Studies Applicable to Apollo," 5 April 1962; Harold Hornby, interview, Ames, 28 June 1971. 17. For a sampling of research by Harald A. Smedal, see Smedal, George R. Holden, and Joseph R. Smith, Jr., to Dir., Ames, "Ames Airborne Physiological Instrumentation Package," 11 April 1960; Smedal, Brent Y. Creer, and Rodney C. Wingrove, Physiological Effects of Acceleration Observed during a Centrifuge Study of Pilot Performance, NASA Technical Note (TN) D-345 (Langley Field, December 1960); Smedal, Holden, and Smith, Jr., A Flight Evaluation of an Airborne Physiological Instrumentation System, Including Preliminary Results under Conditions of Varying Accelerations, NASA TN D-351 (Langley Field, December 1960); Holden, Smith, Jr., and Smedal, "Physiological Instrumentation Systems for Monitoring Pilot Response to Stress at Zero and High G," Aerospace Medicine 33 (1962), no. 4: 420-27. 18. Hubert C. Vykukal, Richard P. Gallant, and Glen W. Stinnett, "An Interchangeable, Mobile Pilot-Restraint System, Designed for Use in High Sustained Acceleration Force Fields," Aerospace Medicine 33 (1962), no. 3: 279-85; Edwin P. Hartman, Adventures in Research: A History of Ames Research Center, 1940-1965, NASA SP-4302 (Washington, 1970), pp. 479-80. 19. A. B. Kehlet et al., "Notes on Project Apollo: January 1960-January 1962," 8 Jan. 1962, p. 12; Jesse F. Goree to Caldwell C. Johnson, "Command Module RCS Engines," 20 July 1962; Johnson TWX to E. E. Sack and George A. Lemke, "Command and Service Module Reaction Control System Engines," 31 July 1962; Holmes to Assoc. Admin., NASA, "Change in Subcontractors for Apollo Command Module Reaction Control Jets," 24 July 1962. 20. Axel T. Mattson to Charles J. Donlan, "Report on Activities (April 1-April 5, 1962) regarding Manned Spacecraft Projects," 5 April 1962; Clyde B. Bothmer, minutes of OMSF Staff Meeting, 29 June 1962; Falbaum interview; Robert L. Trimpi, interview, Langley, 21 June 1966; North American, "CSM Costs/Schedule/Technical Characteristics Study: Final Report," 2, SID71-35, 30 April 1971, p. II-24; McDonnell Aircraft Corp., External Relations Div., Gemini Press Reference Book: Gemini Spacecraft Number Three (St. Louis, 1965), p. 5; North American, Public Relations Dept., Apollo Spacecraft News Reference (Downey, Calif., rev. ed., 1969), p. 47; Johnson Space Center, "Apollo Program Summary," JSC-09423, April 1975, p. 4-19; NASA, "Project: Apollo 7," press kit, news release 68-168K, 27 Sept. 1968, p. 25. 21. Gilruth to NASA Hq., Attn. : Silverstein, "Preliminary project development plan for a controllable parachute-retrorocket landing system for Apollo spacecraft," 26 June 1961; Gilruth to Langley, Attn. : Office of Cooperative Projects, "Wind tunnel investigation of Apollo Parawing deployment problems," n.d. [ca. August 1961]; Jack C. Heberlig to Johnson, no subj., 28 Aug. 1961. 22. North American, "Earth Landing System, Parachute Subsystem, Proposed Revision," SID 62-482, 8 May 1962; summary of meeting with NAA/S&ID, Northrop-Ventura, and MSC on landing system-parachute subsystem, 10 May 1962; Johnson to North American, Attn. : Paup, "Earth Landing System-Apollo Spacecraft," 16 May 1962; Benner interview. 23. Barton C. Hacker and James M. Grimwood, On the Shoulders of Titans: A History of Project Gemini, NASA SP-4203 (Washington, 1977), pp. 31-296, passim; Johnson to North American, Attn. : Sack, "Implementation of recommended actions from Design Review Meeting, June 4 and 5, 1962," 15 June 1962, with enc., minutes of MSC-NAA Spacecraft Design Review Meeting No. 3; Bothmer, OMSF Staff Meeting, 29 June 1962. 24. Johnson TWX to North American, Attn. : Paup and Markley, 30-Jan. 1962; George P. Burrill III to Assoc. Dir., MSC, "Visit to Massachusetts Institute of Technology (MIT), December 19-29, 1961," 3 Jan. 1962. 25. Glenn F. Bailey, "Request for Proposal No. 302, Feasibility Study for Project Apollo" [13 Sept. 1960], with attchs. A and B and enc., "General Requirements for a Proposal for a Feasibility Study of an Advanced Manned Spacecraft"; Kehlet et al., "Notes on Project Apollo," p. 8; Johnson enc., minutes, Design Review Meeting No. 3; Thomas V. Chambers to Assoc. Dir., MSC, "Coordination Meetings with MIT personnel," 27 Nov. 1961; MSC, ASPO Management Report for 16-23 April 1964. 26. MSC, abstract of proceedings, Guidance and Control System Meeting No. 2, 7 June 1962; Robert D. Weatherbee engineering memo to MSC, Attn. : Charles C. Lutz, "Transmittal of NASA-MIT-Apollo Space Suit Assembly Contractor Meeting dated December 5, 1962, HSER 2585-5," 22 Jan. 1963, with enc., minutes of spacesuit navigation system optical interface meeting between NASA, Hamilton Standard, International Latex Corp., and MIT at Cambridge, Mass., 5 Dec. 1962; Project Apollo Quarterly Status Reports: no. 2, for period ending 31 Dec. 1962, p. 12, and no. 3, for period ending 31 March 1963, p. 29. 27. H. E. Van Ness to STG, Attn. : Robert G. Chilton, "Apollo Navigation and Guidance Meetings," 13 Oct. 1961; Proceedings of the NASA-University Conference on the Science and Technology of Space Exploration, Chicago, 1-3 Nov. 1962, NASA SP-11, 2 vols. (Washington, 1962), papers 27 through 32. 28. Robert C. Seamans, Jr., to MSC, Attn. : Gilruth, "Appointment of Evaluation Board," 31 Jan. 1962; Webb, "Statement Of the Administrator, [NASA], on Selection of Contractors for Apollo Spacecraft Navigation and Guidance System MIT Industrial Support," n.d.; NASA, "Contractors Selected for Negotiations - Apollo Guidance System," news release 62-112, 8 May 1962. 29. Seamans to Admin., NASA, Trip report to Wakefield Laboratory of A. C. Spark Plug Co., July 16," 25 July 1962; Aaron Cohen, interview, Houston, 14 Jan, 1970.